This chapter really got to me. Why did Oda have to make it be like this? I wish I could do something about it. This is pretty much a continuation of the scene that we left of from last week. Sanji had just kicked Luffy away from his family and told both Luffy and Nami that he was leaving the crew to join Big Mom. This was both very formal and aggressive. Now most people would either get very angry with their friend and fight back or they’d think he’s not worth their time and would come crawling back later when he’d realised. Luffy fortunately is not most people and he did the most Luffy thing in response… Refuse his refusal to return to the Strawhats. What happened next was difficult to digest. Sanji went forth and tried beating it into Luffy who refused to fight back. This took me back to the time Bellamy beat Luffy and Zoro. They didn’t fight back at that time and although the situations are completely different, it just shows Luffy has control. 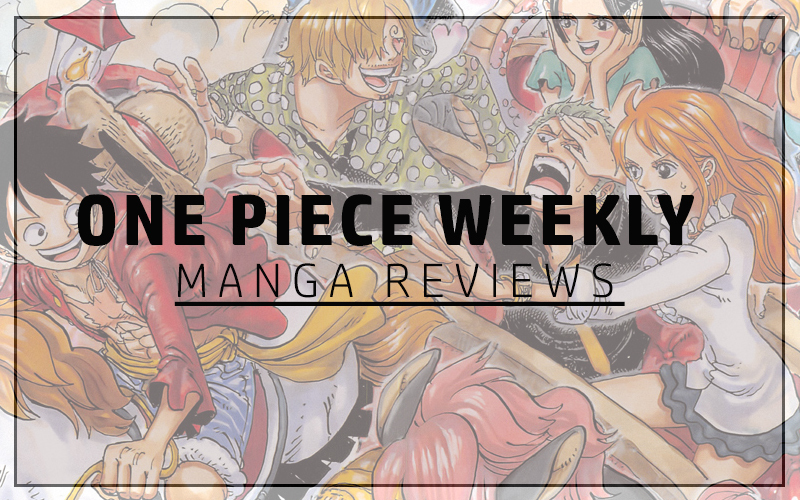 It was painful to watch because of the pain both Luffy and Nami were going through but more so the pain Sanji is going through, kicking the crap out of his captain and friend. Eventually Nami had to step in and tell him to stop as Luffy lost consciousness for the moment. That’s how bad the situation got. Sanji even had to bear a slap to the face as Nami pretty much ended everything they ever had at that moment, giving up on her former friend and nakama. It was Luffy though, who got back and declared it all an act. He knows Sanji too well and knows what he’s going through but he made it loud and clear he won’t be letting it go, despite taking the beating. 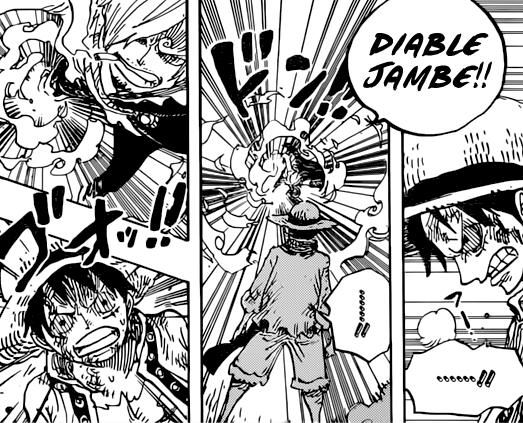 Luffy pulled out something I didn’t expect and something Sanji didn’t either. 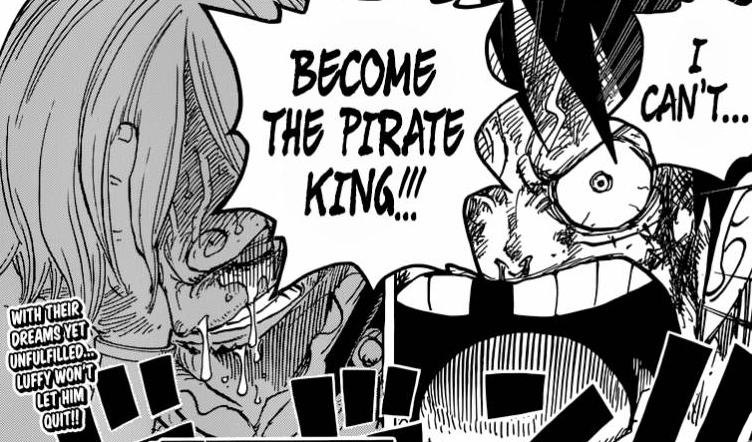 He pulled on those heart strings in such a way that Sanji could no longer hold it together and started pouring out his soul into his hands in the form of tears. Luffy claimed not only would he not eat unless Sanji cooked it for him but he wouldn’t chase his dream of becoming the pirate king without Sanji by his side. That declaration is pretty much set in stone. Luffy will get Sanji back for definite. No matter what it takes! 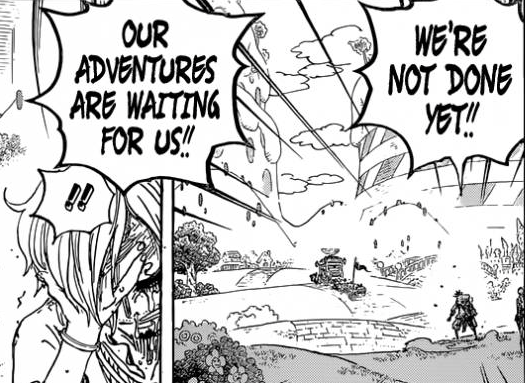 This chapter was an emotional rollercoaster and I sincerely hope Luffy, Nami and Sanji can recover from this. That final declaration was definitely something. Let’s see how Sanji reacts.